Phi Gamma Delta, also known as Fiji, is dedicated to developing men of character within the academic setting, with the aim that they will become fully contributing members of society. In pursuit of this mission, the Fraternity promotes five core values: Friendship, Knowledge, Service, Morality, and Excellence. The pursuit of knowledge is why each student comes to Kettering, which is why, as Fiji’s, we hold true to our three Priorities, in order of precedence: Scholarship, Fraternity, and Self. It is this mindset that sets Fiji Brothers apart from the rest and allows us to excel in everything we do on campus. 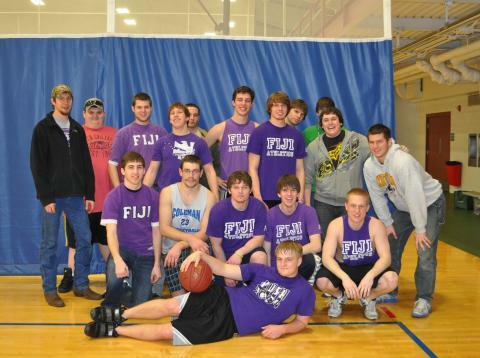 Fiji’s are often known as leaders on campus, including involvement in organizations such as the Inter-Fraternity Council, Student Alumni Council, Kettering Student Government, Unit Buddies, Robotics, various Greek Honors Societies and many more. Through our involvement we also participate in many hours of community service. Events such as Highway Cleanup, volunteering at the Flint Children’s Museum, and helping out with the Crim Race not only provide a great service to the community but create very fun times for us as well. We also hold our annual Randy Hamkins Memorial Golf Tournament for the Randy Hamkins Scholarship and 3 v 3 Basketball Tournament for the American Cancer Society. Both of these events allowed us to raise over $3,000 total for the charities in the past two years alone. Phi Gamma Delta is “Not for college days alone,” allowing us to create and maintain friendships between our classmates as well as older students. It is also inevitable to have many friendships with previous Phi Gamma Deltas’ that graduated before your time at Kettering, simply because of the rich brotherhood that is within. We hope to see you this summer whether it is playing volleyball at our house, or intramural sports out in the fields. We will also see you in the classroom, in the library, and even the campus pool!